pseudoparanormal: Does Absinthe make you hallucinate? The notorious European born liquor absinthe has a terrible reputation for being more of a drug than liquor. If asked, most people around the world will tell you about that same thing, “absinthe makes you see the green fairy, it’s a hallucinogen”, well I’m here to say no, it isn’t, and the story behind it all is really quite interesting. It all started in France, like so many other things, Absinthe is a liquor made by filling huge cauldrons with pure gain alcohol and adding a variety of herbs and spices and letting it marinate for some length of time. What exactly goes in depends on the maker and the region but the two most famous ingredients by far are the star anise(that liquorish stuff) and wormwood. Wormwood has oil in it that contains a substance called thujone. This is the magical substance that supposedly makes you hallucinate. The strange thing about thujone is that it was discovered in the 1800’s but still isn’t entirely understood. Its supposedly chemically similar to a substance known as tetrahydrocannibinol, more commonly known as THC. THC just happens to be that stuff in marijuana that everyone gets so excited about and because they’re chemically similar its assumed that in your body thujone acts similar to THC. Well now, that’s the science, its supposed to be like marijuana but marijuana doesn’t have nearly as bad of a name as absinthe, what could have happened? Well it all started in France just around 1800, industrialization of the process to make absinthe was perfected but costs were high so it remained a drink of the elite. As availability grew absinthe became the drink of artists and intellectuals. 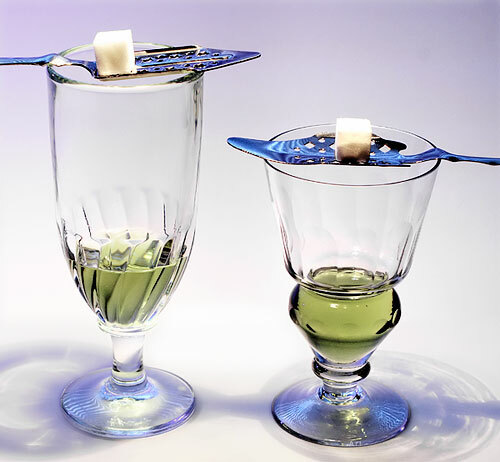 Sometime not too much later absinthe began to be issued to French troops in the field to purify water and treat malaria and from there these soldiers brought a taste for the drink back further the spread of absinthe drinking. By the 1870’s absinthe was everywhere in France and with a wine crop failure absinthe took over as the most popular alcohol in France. When the wineries recovered they were ready to take back as many customers as they could, using any means necessary. Wineries aligned themselves with the temperance movement and started a giant smear campaign attempting to defame absinthe as much as possible. Somehow they managed to change the public perception of the drink into more of a drug that is terrible for you and will make you do even worse things. By the onset of World War one absinthe was banned in most countries even France, the land of its birth. Not until the 90’s is absinthe legal in the U.S. and most places around the world. Now even though all of this is public information absinthe still carries this stigma of drug like effects. The allowed thujone limit in the U.S. is 10mg/L which is almost none. This standard is roughly the same all over the world but there are absinthes, some legal to buy and some not, that claim thujone levels in excess of 250mg/L. Now I know we all want to know “ that’s all fine an dandy, but how much thujone do I need to feel it?”. Well there is no clear awnser, thujones effects aren’t exactly a sure thing so theres no real way to say how much one would need to be effected by it. One this is for sure though absinthe is starting to pick up in populatity and is even starting to be found in bars in the U.S., so the next time your out ask around and get yourself a glass and figure out how many drinks until you see the green fairy. I work in a liquor store that actually sells the "watered-down" version of absinthe that are available here in the U.S. Every time someone is looking for it they always ask the same question: "Is this the "real" absinthe?" I assure them that it is indeed absinthe, but it's not what they think it is. I knew that the absinthe here in America didn't quite have the same level of thujone that it is traditionally known for and that usually disappoints people. For the price of it (usually somewhere around $50-$60 a bottle) people genuinely want the real thing. Well I personally have been around Europe and tried many different types. There are actually different styles of absinthe and even from brand to brand within styles they are very distinct even to someone who hasnt tried much absinthe. The funny thing is even with the higher thujone content its arguable if it even does anything. So go ahead and buy the pernod you find in American stores its a good example of french absinthe and does about the same job. I you want "something stronger" as far as thujone goes, those bottles can be upwards of 300 dollars and theres no guarantee of it actually being any different, probably just more alcoholic, as thujone isnt regulated or even the main concern when making absinthe(more of an accident that its there). This was a great topic to do your post on. You did a great job explaining and providing truthful facts. I personally have tried absinthe and did not hallucinate. This is really interesting. I had always thought that absinthe was actually designed to be hallucinogenic. Very well put together post, good job. I have never heard of Absinthe! If alcohol has hallucinogenic properties it surprises me that it would remain on the market for sale. Today we ban alcohol like 4-Loko because of its caffeine and high alcohol content; I wonder why Absinthe is still sold. I'm glad you did a post on this, it's very interesting! All of my friends always joke around about going to Europe just to try Absinthe since it's supposed to make you hallucinate; now i can be the one to explain to them that it may not! I know my one friend tried it once and it didn't do anything to him, but now i actually know why. I have drank a lot of absinthe and never hallucinated although it is extremely strong. I have had one kind in Europe that was made from grain alcohol that was 190 proof I think. Drinking enough of anything with that much alcohol can probably make you hallucinate. About 4 or 5 years ago a upscale bar near my home began to serve absinthe, but there was a two drink maximum for some reason, which was fine by me because they were $14.00 each and that stuff tastes awful even when it is doused in flaming melted sugar! It tastes like burnt black licorice...Gross!! !